Farm raised catfish is the largest aquaculture industry in the United States. In 2005, the U.S. catfish industry produced 600 million pounds of catfish from 165,000 pond water acres. The farm-raised catfish industry at $450 million in annual production value has the highest economic value of any aquaculture industry in the United States. The next highest valued aquaculture industry in the country is trout, valued at $74 million in annual production. Mississippi produced 350 million pounds, or 55 percent, of all U. S. catfish production in 2005, and Mississippians produced this amount in only 100,000 pond water acres. Since its origin in the 1960s, the catfish industry has grown rapidly and now has an economic impact in the hundreds of millions of dollars in Mississippi each year. Arkansas, in 1963, was the first state to produce farm-raised catfish on a commercial level. Mississippi was not far behind when its commercial production began in 1965. After 1970, rapid expansion of catfish production in the Mississippi Delta occurred, and Mississippi has led the catfish industry ever since. Channel catfish, which is ideally suited to a pond environment, quickly became the standard species for commercial use. These fish are hardy, tolerate dense stocking, and thrive in a wide range of environmental conditions. They are easily spawned under proper conditions, yet will not spawn when placed in the grow-out ponds, which gives the farmer control over the production process. Fish newly hatched from the egg, called fry, readily accept manufactured feed and continue to eat feed until they are harvested at a weight of one to three pounds. The catfish’s most important asset is its good taste which drives the demand for this healthy food. The white channel catfish flesh is firm with a mild flavor allowing it to be prepared and seasoned in a number of ways, such as fried, broiled, grilled, or baked. Before catfish were produced in ponds, Mississippians supplied their kitchens and their fish-fry events by either catching their own catfish in nearby rivers using cane poles, or buying catfish from fishmongers or commercial fishermen. Restaurants serving catfish have always been popular in Mississippi and require lots of catfish. At times commercial catfish fishermen could not supply enough wild-caught river catfish and pond-raised catfish began to fill the need. Over time the consistent quality and quantity of pond-raised catfish produced by farmers was preferred over the commercial fisherman’s wild-caught river catfish. Mississippi had many early pioneers in the farm-raised catfish industry who came from a variety of backgrounds. Many of them entered into the catfish industry because they were looking for crop diversification or for profitable alternatives to growing cotton on marginally productive lands, while others entered the business because of the novelty of growing fish in a pond as a crop. Catfish farming practices have changed since the days of the early pioneers. In the 1960s, catfish ponds ranged from twenty to forty acres while today the typical pond has been reduced to ten to fifteen acres because it is easier to manage, feed, and harvest catfish from smaller ponds. Catfish harvesting and loading methods have changed as well. In the 1960s farmers entered the drained pond with wash tubs, loaded the tubs with fish, and carried them up the pond embankment. The fish would be weighed on cotton scales and then lifted up and dumped into the back of a hauling truck. Today seine nets are used to capture the fish, without draining the ponds, and cranes equipped with scales hoist large nets full of catfish from the pond directly to truck hauling tanks, making the whole process much easier and quicker. Heat oil to 350 degrees. In a bowl, add eggs and beat. In a separate bowl, add panko bread crumbs and seafood seasoning, mix well. Season catfish with salt, pepper and seafood seasoning. Dip catfish in eggs, then dip in panko bread crumbs. Add catfish to hot oil and fry for 3 minutes. Remove catfish and place on paper towels to drain. 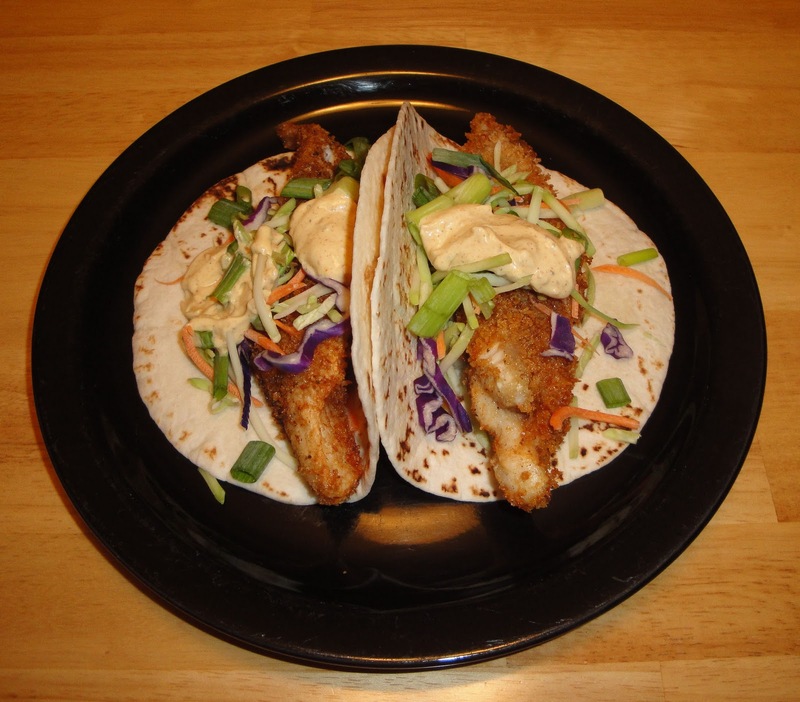 Add one strip catfish to tortillas, then add cole slaw, green onions and sauce. Enjoy! In a bowl, combine all ingredients. Cover and chill until ready to serve. Oh Christine... I LOVE me some fish tacos and these look fantastic!! Now I'm craving these again... lol! Sounds yummy!! I love fish tacos! Great use for catfish Christine. I've never been a fish taco fan, but I have to say these look incredible. I love fish tacos!!! Great recipe, Chrisine! These look delish. Before I developed an allergy to fish (sea and fresh water) I went to an old fashioned fish fry - it was amazing! Freshly caught - there's nothing like it! They look so good! Love the brightly coloured coleslaw. I've never had catfish, being Australian but am fascinated by southern US cuisine. Now this is my type of Tacos!!!! I love fish and this looks so good, Christine! I'll be making this soon. Can't wait. Catfish is so easy to buy too! Catfish is really really cheap over at my place Christine and its the life ones jumping up and down in the plastic containers. I have not tried it before but your recipe is tempting enough to give this fish a try. I thought these looked wonderful. It is 7 a.m. and I got up hungry. I think I could eat one right now! Thanks for the recipe. Catfish is something I can buy fresh, so I am glad you posted this. 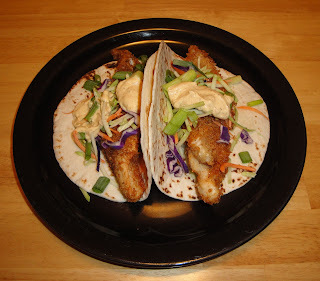 I love fish tacos-Great recipe. I love fish tacos and this recipe. I appreciate that the fish is baked. I used to go fishing with my when I was a little girl, and we would catch catfish. I haven't a realy fresh catfish in years, but so good. I have to say it... NOM NOM delicious! Reminds me of the yummy food in NOLA! Maybe this will take care of the taste I'm missing from not actually being there. Thanks Christine! I am going to have to try these, my Dad would love them! Thanks y'all for all your kind comments. You and your comments mean a lot to me. I appreciate you. Hugs! Panko and catfish totally go together! Sounds yummy, I love fish tacos. Thanks for all of the education too! I love fish tacos - yours look really good. I have never tasted catfish before! Fish tacos! Haven't tried it with catfish, but I'm sure it's delicious. Thanks for sharing! I just love fish tacos of any kind! Good use of catfish and I like all the spices. I've tried, but catfish is just not for me. My husband loves it though and this recipe looks lovely. I'll be passing it on to him for sure! Those tacos look perfect. I love the unexpected taste of fried fish in a tortilla. Great post and recipe. This looks great. What an informative post! I love learning new things. The recipe looks delicious too! I know I say this a lot but don't feel like I can say this enough, thank you all. I appreciate you and your comments. You guys rock. Love you all. Hmmmm...catfish makes good fish tacos! Love this, Christine! Oh how I love fish tacos, can't wait to try these, they look so yummy!! !